There have been big changes over at my main blog, Blue Kitchen. It’s bigger, more robust and filled with even more resources for home cooks and two new posts every Wednesday. So with more than a little sadness, I’ll no longer be updating What’s on the kitchen boombox? or my other sidebar blog, WTF? Random food for thought. As much as I loved writing them, they’ve just never gotten the kind of readership that warranted keeping them going. The second weekly post I mentioned above will pretty much take the place of WTF?, although in a more food-focused, less random sort of way. And every once in a while, when the right piece of music catches my ear, the kitchen boombox will turn up there. I will leave these two blogs up, however. So anytime you want to poke around in the archives, please come back. I know I will on occasion. Thanks for reading! I hope to see you at Blue Kitchen. The 30th annual Chicago Jazz Festival is coming Labor Day weekend. I know I said that last week, but it is just. So. Cool. So again I’m revisiting an album I’ve spoken about before in anticipation. 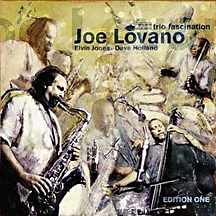 Sax player Joe Lovano is the front man on Trio Fascination—Edition One , but my primary interest is his bassist on this outing, Dave Holland. I wrote about Holland’s sublime album with his quintet, Prime Directive , several months ago. And I’m happy to revisit this fine disk here. I’m not normally a fan of trios. They’re usually the work of a front man—on sax or piano, typically—and a rhythm section, typically a bassist and drummer. And what happens more often than not is the lead guy has to do all the musical heavy lifting, with the rhythm guys each getting occasional and often tedious turns in the spotlight. I much prefer quartets or quintets, where a couple of horns or a horn and a piano play off each other, often in overlapping conversation. Much more texture and interest to be had. But Joe Lovano is a versatile, prolific sax player who has been called one of the brightest tenor players on the jazz scene today. And when I saw bassist Dave Holland and drummer Elvin Jones on the roster, I knew Trio Fascination—Edition One would be worth a listen. It is. Lovano makes the most of this line-up. There’s no “just follow me, boys” front man/side men feel to this album—you get the kinds of conversations I look for in quartets and quintets. The music [nine of the ten tracks are written by Lovano] continually blurs the line between straight bop and free jazz, always a good sound for me. There’s plenty of variety in the compositions too, not always a given when the tunes all come from the same source. The disk holds your attention start to finish. The one non-Lovano track is the jazz standard Ghost of a Chance. Coming near the middle of the disk, it felt like the odd man out the first couple of listens. But the more I listened, the more it grew on me. Its languid pace and haunting, melodic treatment stick with you, and it serves as kind of a palate-cleansing intermission among the more angular pieces. A caveat: If you go looking for this disk, do not get sucked in by Lovano’s Flights of Fancy, Trio Fascination Edition Two. On that disk, he hooks up with various musicians in trio settings, never as successfully as he does with Holland and Jones on this one. Worst of all, one of those musicians is harmonica player Toots Thielemans, on far too many tracks. I don’t know who first decided harmonica and jazz went together, but they don’t. The 30th annual Chicago Jazz Festival is coming Labor Day weekend. Local and national jazz artists will descend upon Millennium Park and Grant Park for four days—and it’s all free! This year’s festival is bookended by headliners Sonny Rollins, the saxophone colossus, and Ornette Coleman, widely regarded as the creator of free jazz. Jazz clubs throughout the city will pick up where the festival leaves off each evening, with jam sessions and special events. We are so there. In anticipation of this amazing jazz feeding frenzy, I’m revisiting a couple of jazz albums I’ve talked about before, this week and next. Julian “Cannonball” Adderley: Somethin’ Else . Bassist, composer and bandleader Oscar Pettiford was not what you’d call a people person. In fact, he was known for his temper and personnel problems throughout his brief career. So on that fateful night in 1957 at Café Bohemia in Greenwich Village when the sax player was late and a high school band teacher from Fort Lauderdale found himself up on the stage ready to fill in, Pettiford counted off I Remember April at a breakneck tempo, probably figuring he would send the country boy packing. But this high school band teacher was Julian “Cannonball” Adderley, brother of cornetist Nat Adderley and a firm believer in the Charlie Parker school of thought that there was no such thing as too fast. As jazz historian Leonard Feather puts it in the liner notes, Cannonball “met the challenge with a long solo that just about knocked Pettiford off the stand.” Two days later, he was working full time with the band. Soon after that, he signed with the Savoy label. Miles Davis regularly attended the band’s performances at the Café Bohemia. “Everybody knew right away that [Cannonball] was one of the best players around,” Davis said in his autobiography, Miles. He and Cannonball went on to play and record together. The 1958 album Somethin’ Else shows what a true collaboration it was—Cannonball was the bandleader, but he and Miles trade solos equally. In fact, when I first heard the disk, I thought it was a collection of Miles Davis repackaged under Cannonball’s name. Also interesting is how well Cannonball’s hard bop approach and Davis’ cool sound mesh. As a major fan of hard bop’s energy and sharp corners, I can definitely hear the restraint in this album. There are none of the high-speed fireworks that made Cannonball an instant sensation that night at Café Bohemia. But there is amazing, beautiful music, created by two groundbreaking artists. There is also a palpable sense of time and place, particularly on Davis’ Somethin’ Else and on Alison’s Uncle, a bonus track that didn’t appear on the original album. Close your eyes and you’re in a New York jazz club, probably in some cellar in the Village. The men all sport narrow-brimmed fedoras and Buddy Holly glasses. The women, off-the-shoulder cocktail dresses and Mamie Eisenhower bangs. Everyone is laughing and drinking and smoking, and it’s all in black and white. Yeah. The other night daughter Laurel and I were driving around, listening to rock music on the college end of the radio dial. Probably WNUR or WLUW. Normally, when I’m listening to this end of the dial, I’m looking for fast and loud. In fact, there’s a show on WNUR called Fast n’ Loud, and it’s one of my favorite things on the air. But a song came on that slowly insinuated itself into my consciousness—you know how that goes, you’re driving, talking, thinking about your next errand and suddenly you become aware of the music playing. It was industrial sounding and hypnotically repetitive, but not in the overly synthesized way a lot of industrial dance music is these days. When I said it sounded “not uninteresting,” Laurel said she had a CD I might like, by The Liars. I’d seen The Liars perform once before when they were touring with the Yeah Yeah Yeahs. At the time, at least, The Liars’ lead singer was dating the Yeah Yeah Yeahs’ Karen Oh. Cute, right? I remember The Liars being good, but pretty much a funk-driven art school party band. A lot of fun in concert, but nothing memorable. They Were Wrong, So We Drowned, their 2004 release, is not art school party music. It is industrial and dense and just as wonderfully dark as the title promises. According to one reviewer, it is inspired by a type of German witchcraft. Certainly the song titles bear this out: Broken Witch, for instance, seen in a live performance at New York’s Knitting Factory below. And There’s Always Room on the Broom and They Don’t Want Your Corn, They Want Your Kids. Often I talk about actively listening to music. This album seems just as satisfying heard in the background—at home, driving, on the subway. Its layers of electronic sounds are balanced by almost feral instrumentation [simple, repetitive drum beats, in particular] and vocals reduced [or refined] to chants. The overall effect is like a disturbing movie soundtrack. In fact, the fifth track, We Fenced Other Gardens With The Bones Of Our Own, sounds like nothing so much as that moment in a dark thriller in which revelations have happened and one character is suddenly in determined, methodical pursuit of another. We know that soon one of them will die, violently. Okay, I’m guessing none of this is making They Were Wrong, So We Drowned sound like the feel good album of the year. But it is a satisfyingly moody listen. According to Laurel, their latest album is similarly interesting. I think I’ll be exploring that one too. One of the great things about our household, in fact, is how we’re all bringing new—and old—music into the house and constantly learning from one another. A topic for another post, perhaps. Okay, you just read about the unexpected health benefits for your brain that dancing delivers at WTF? Random food for thought. Now here are some tunes to get you dancing, courtesy of YouTube. I love the Internets. First, I’ve got to start with fellow St. Louisan Chuck Berry and his seminal 1958 rock & roll tune Johnny B. Goode. The oddly bad dancing by the girls on the raised platform is entertaining. The rest of the dancers are much better, and Chuck even does the duck walk for us. Next, the Rolling Stones mix danceable with dark in perhaps my favorite song of theirs, Gimme Shelter. A little known fact about this next song. The group’s name was originally Two Tons of Fun. But after the huge hit of It’s Raining Men, they changed their name to the Weather Girls. Cameo gives us Word Up, another big ’80s hit. They also give us a decidedly weird music video, complete with a cameo appearance by Levar Burton as a dancing detective. And finally, Talking Heads and Burning Down the House. We used to follow a very cool cover band in St. Louis, The Heaters. They did this song one night at the Broadway Oyster Bar and pretty much burned down the house. Later, they disavowed all knowledge of the event. There you go. If none of these songs got you dancing, I want a note from your doctor. I wasn’t always into avant garde jazz. In fact, Oliver Lake and his no-holds-barred free jazz actually put me off jazz for a good long while. So as I made my way back into jazz, I gave alto saxophonist Ornette Coleman, one of the major innovators of the free jazz movement, a wide berth. I’ve since embraced the avant garde, thanks in no small part to Chicago reed player Ken Vandermark. Still, Coleman’s reputation as an inventive and often challenging experimenter with sound is legendary. So when I came across an album of his titled Change of the Century, I was excited to see what all the, um, noise was about. I mean, we’re talking about a man who, early in his career, was assaulted after a performance and his saxophone destroyed. What I found in this 1959 release was another example of the need for reliable, affordable time travel. My first couple/few listens, it was hard for my less than trained ear to pick up much difference from be bop being played at the time. I’ve heard enough of what has come since that this was just not the revolution I was expecting. But what I heard from the first listen was really exciting jazz. And the more I listen to it, the more innovative and even angular some of it indeed sounds. Like much of the best jazz I’ve heard, the music is a true collaboration and conversation among all four musicians. There is no leader/sidemen vibe. You couldn’t ask for better collaborators either: Don Cherry on pocket trumpet, Charlie Haden on bass and Billy Higgins on drums. Small wonder that Amazon has named it an essential recording. Maybe Change of the Century isn’t quite what the name promises, but it is part of a sea change in music. Just as important, it’s some great, listenable jazz. The kitchen boombox is nothing if not eclectic. Depending on my mood, energy level and even what I’m cooking, it can be playing anything from opera to punk to avant garde jazz to you name it. When I’m looking for high-energy fun to get me going, this album always delivers. The Mighty Blue Kings debuted in 1995, opening for Junior Wells at Buddy Guy’s club Legends. They soon had a weekly gig at Chicago’s vaunted Green Mill. A renewed interest in jump jazz and swing dancing was just heating up, and these boys were nailing it. Ross Bon’s spot on period vocals backed by tight horn and rhythm sections perfectly captured a vintage sound as they performed a mix of old songs and original tunes that seemed right out of the 40s. The vibe of their live performances was loose-hipped fun. Soon they were touring more than they were at the Green Mill, and when they did get back to Chicago, the Green Mill was too small to accommodate their crowds. These YouTube clips are from a performance at a larger Chicago venue, Metro. They’ll give you a sense of their style and sound, if not of the energy of those nights in Uptown at the Green Mill. There are 14 tracks in all on Meet Me In Uptown, a fun mix of uptempo swing and boozy ballads. Together, they’re guaranteed to get me and any visitors to my kitchen moving. You’ll find new and used CDs on Amazon as well as downloadable MP3s. Give them a listen—I think you’ll want to bring a little Uptown to your kitchen too. I saw recently that classical pianist Gary Graffman was performing somewhere in town. That made me think of his most famous recording, the soundtrack of Gershwin music for Woody Allen’s Manhattan. The highlight of the disk, the reason for owning it, is Graffman’s powerful treatment of Rhapsody in Blue—you know, the United Airlines music. That was reason enough for me to haul out the Manhattan soundtrack CD and pop it in the boombox. For Gershwin, Rhapsody in Blue represented “a sort of musical kaleidoscope of America, of our vast melting pot, of our unduplicated national pep, of our blues, our metropolitan madness.” But for most of us, it is inextricably linked with New York—the grandeur and power, the grittiness and cacophonous energy. Listening to Graffman capture all of that, sometimes playing alone, sometimes backed by the New York Philharmonic, conducted by Zubin Mehta, I remembered long ago hearing recordings of Gershwin playing Rhapsody in Blue on solo piano. It was of course on YouTube. I love the Internets. Here it is, in two parts. I’m happy to report that Graffman’s performance stands up beautifully in comparison, feeling just as complex, in turn just as powerful, as haunting. And yes, he has an entire orchestra behind him, but he plays long passages solo. When the Manhattan soundtrack came out on vinyl, the first side was Rhapsody in Blue. The second side is a wonderful mix of other Gershwin tunes—some complete songs, others mere snippets—used as incidental music in the film. Ranging from lush, romantic renditions of tunes like Embraceable You and Someone to Watch Over Me to an almost comic treatment of Lady Be Good that never fails to make me think of Bugs Bunny crossing some swell hotel lobby, removing white gloves one finger at a time. Taken as a whole, this album perfectly mirrors the love letter to New York that Allen’s film was, evoking a New York that, to many, no longer exists. And as wonderful as New York is to me now, it makes me wish I’d known the earlier one too. And finally, I mentioned the United Airlines advertising campaign that used Rhapsody in Blue. Here’s an example of that, a rare 60-second commercial the airline used to “rededicate” itself to business. Ten points if you know who the voiceover talent is.